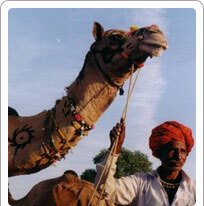 Nagaur Fair is India's second largest cattle fair. Nagaur is a picturesque town lying between Bikaner and Jodhpur. More than 75,000 camels, bullocks and horses are traded here each year. This fair is extremely popular with tourists. The sheer size of the festival as the events that are held as a part of the fair, such as tug-of-war, camel and bullock races and cockfights and performing arts like music and dance, keep the visitors enthralled. The vibrant red-chilly market or the chilli bazaar that springs up during the fair is another unique aspect of the Nagaur festival. Men wearing colourful turbans and flaunting long moustaches as well as women in their colourful traditional attire give many a keen photographer the photo opportunity of a lifetime. This festival lasts for four days. The desert sands come alive with the vast number of cattle, people and shops. Apart from the fair, the town has other attractions as well. Badal Mahal, Sheesh Mahal & Hadi Rani Mahal are all well worth a visit.